How are you? Sometimes it’s hard to find people who understand me. Thank you. I wrote this song about seven years ago I think, in my so called folk song, protest period. Anyway, I still play this. It seems to hold up really well though, ha-ha. Thank you. I wanna introduce you now to one of America’s last great rock ‘n’ roll bands and surely one of my favorites. 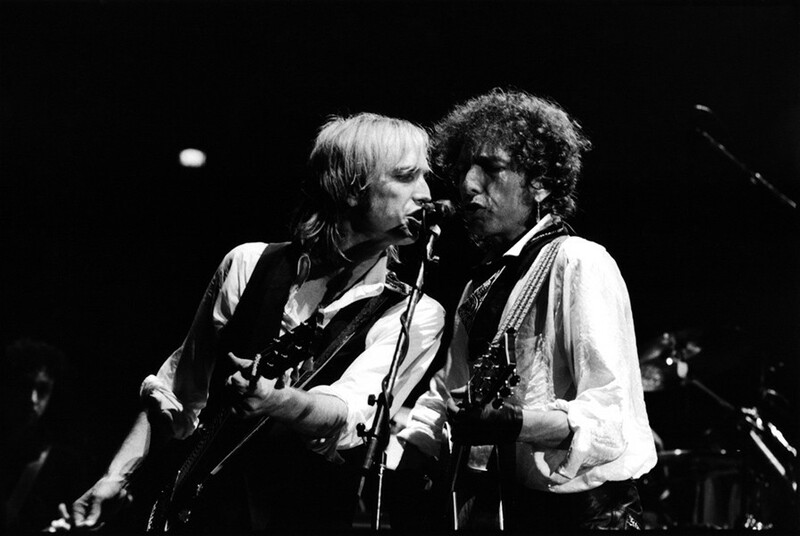 Tom Petty and the Heartbreakers. Thank you! Well, I just read another concert review the other day. It said “Bob’s sounding like a parody of himself. He sounds just exactly like he’s imitating himself”. I should like to know who I’m supposed to sound like, you know. I know it’s hard when so many people sound like me these days. But someday, somebody got to tell these people that I’m still here. Well, I can’t sound like anybody else. I don’t know how to. If I did, I would. Thank you, all right. Here’s a song I wrote a while back about one of America’s greatest forgotten men. This man was just a little bit before his time. He said some things which got him into trouble with the wrong people. But there’s a lot of people right now saying a lot of things much worse than he ever could have dreamed of. And of course they’re making millions of dollars and they’ve got nice houses and drive fast cars. And they got lots of pretty women. He didn’t have none of that stuff at all. All right, everybody must get stoned. I meant that song as it could be taken a couple of different ways. That’s one of them, but here’s one that can be taken but just one way. Thank you. It’s called Borderline. For all you rock critics who are out there. Don’t forget that rock critics did it all the time. Thank you. I wanna, I wanna thank Tom Petty and the Heartbreakers for backing me up tonight. On the keyboards, give him a warm hand, Benmont Tench. All right, on the drums, Stan Lynch. Playing the bass and the mandolin, Howie Epstein. All right on lead guitar, Mike Campbell. I especially wanna thank Tom Petty. And of course my sweet singing partners over on the left. All right. Yeah, we gonna get out of here now. Yeah. We got to go. It’s way past my bedtime, I don’t know about you. Anyway we always sing this last song here. It’s about my hero. Everybody’s got a hero. Some people got a hero, lots of different heroes. Money is a hero, success is a hero. To lots of people Michael Jackson’s a hero. Bruce Springsteen, John Wayne, everybody’s got a hero. Shut up you! Well, I wanna sing about my hero, I don’t care about those heroes. I have my own hero. … and I should have remembered to thank whoever posted this stuff. You’re lucky to have been at those shows.. I left England to work in Sydney with my new wife in July 1985. Catching up with Bob at the city’s Entertainment Centre was one of many highlights of my time in Oz. Unlike England, getting a ticket in Australia was a breeze. The show was fantastic from start to finish, although I can’t be sure if this was the actual concert we witnessed as he played more than one night. When he performed Just like A Woman (then my favourite of his songs) I could have cried. Tom Petty and his band, and the backing singers were brilliant. So I was sure to see Bob close-up from the distant seat I booked I took along a pair of binoculars, especially bought. And I remember watching him share a smoke with one of his backing singers at the back of the stage while Tom and his Heartbreakers were rocking the audience. I still have those binoculars… and some brilliant memories.